LAS VEGAS--(BUSINESS WIRE)--On January 5, 2018, 20th Century Fox, Panasonic Corporation and Samsung Electronics announced updates to the associated certification and logo program for the open, royalty-free dynamic metadata platform for High Dynamic Range (HDR), called HDR10+ which they initially announced last year at IFA. The HDR10+ license program will provide interested companies with the necessary technical and testing specifications to implement HDR10+ technology in a way that both maintains high picture quality and gives each manufacturer the ability to apply dynamic tone mapping innovatively. The accompanying certification program will ensure that HDR10+ compliant products meet good picture quality and deliver the creative intent of movie directors and cinematographers. A certified product will feature the HDR10+ logo, which signifies the product's excellent picture quality. - Benefits for device manufacturers (e.g., TV, Ultra HD Blu-ray, OTT STB, etc. ), content distribution services providers, SoC manufacturers, content publishers, and content creation tool providers. - No per unit royalty. - A nominal annual administration fee for device manufacturers, SoC manufacturers and content distribution service providers. - Technical specification, test specification, HDR10+ logo/logo guide, patents from the three companies directly related to the technical specification and the test specification. - Certification for devices will be performed by a third-party, authorized testing center. "It was important for us to create an open system that is flexible and offers a viewing experience much closer to the filmmaker's creative intent for the film," said Danny Kaye, Executive Vice President of 20th Century Fox, and Managing Director of the Fox Innovation Lab. "Together with Samsung and Panasonic, we aim to standardize the licensing process making it easy for partners, including content creators, television and device manufacturers, to incorporate this technology and improve the viewing experience for all audiences." 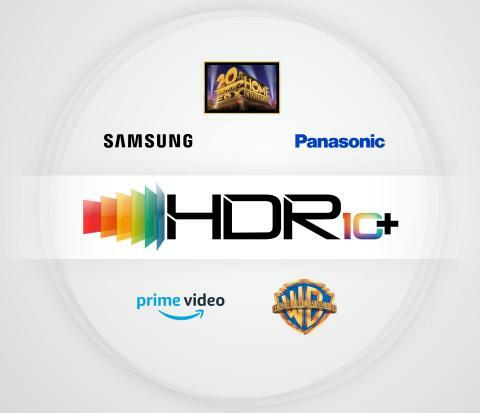 Warner Bros. Home Entertainment will support HDR10+ to enable a dynamic metadata solution for Warner Bros. content to Samsung, Panasonic and other HDR10+ capable 4K HDR TVs. "Warner Bros. has always strived to provide the best next gen home entertainment experience to consumers," said Jim Wuthrich, President of the Americas and Global Strategy, Warner Bros. Home Entertainment. "With HDR10+ dynamic metadata, WB can continue to more accurately bring the filmmakers' vision of our 2018 releases and our vast catalog of over seventy-five 4K HDR titles to the home across a broad range of HDR10+ capable TV's." "By bringing together know-how and technology from the three founding companies, HDR10+ has the potential to deliver considerable picture quality benefits to both viewers and creators alike," said Toshiharu Tsutsui, Director of Panasonic's TV Business Division. "Accordingly, Panasonic anticipates wide support for HDR10+." "Samsung is committed to technological innovation across our TVs and HDR10+ represents an evolution in display quality for the best possible viewing experience," said Jongsuk Chu, Senior Vice President of Visual Display Business at Samsung Electronics. "We have also designed the HDR10+ platform to encourage future development in order to deliver further enhanced technology in the years to come." 20th Century Fox, Panasonic and Samsung showed technical demonstrations of HDR10+ technology at CES 2018. Accredited journalists were able to see Panasonic's HDR10+ technical demo at its suite at the MGM Grand Conference Centre. A HDR10+ technology demo was held at Samsung's First Look event at Enclave Las Vegas on 7th January. Twentieth Century Fox Home Entertainment, LLC (TCFHE) is the industry leading worldwide marketing, sales and distribution company for all Fox produced, acquired and third-party partner film and television programming. Each year TCFHE expands its award-winning global product portfolio with the introduction of new entertainment content through established and emerging formats including DVD, Blu-ray(TM), Digital and VOD. Twentieth Century Fox Home Entertainment is a subsidiary of 20th Century Fox, a 21st Century Fox Company. 20th Century Fox, Panasonic and Samsung Electronics announced updates about High Dynamic Range (HDR), called HDR10+.